We have found Saturdays to be a great day for BBQ fish or seafood. Barbecuing keeps the smells outside and eliminates the over use of oil or deep frying your fish. many patients of mine say they personally don't eat fish or feed it to their children because it is "too hard to cook!" Don't despair - I have a recipe that will have you enjoying it a few times a week. Its all in the crumb (yes crumbed fish can be healthy - just don't plunge it into oil). Find a nice fine breadcrumb (or grate it yourself using slightly stale bread). Add ingredients such as garlic, pesto, coriander, Parmesan cheese, Moroccan spices or zest of lime or lemon. All these flavours enhance the flavour of the fish. 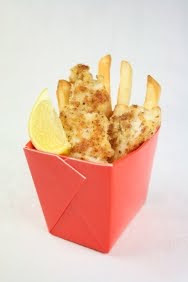 Below is my simple 'fish and chippie' recipe which the kids love (all about the presentation as well! )- it is health, full of Omega 3 fats, low in saturated fat and high in protein. For a more adult taste add one of my suggested ingredients into the crumb. Oh lucky, you're just heading into BBQ season while we here in Oregon have non stop rain! Enjoy your lovely Aussie Spring/Summer! Hubby just asked me to "copy down that fish recipe please". Can't wait to try it!